Rhesus monkey with implants. The titanium implant and recording chamber are of the type currently used in our institute. What exactly are you seeing in this picture? A monkey sitting in its cage and caught in the glare of a bright camera flash. Above the top horizontal bar we see an unidentified red mass that appears to be connected with strange metal pieces. We would like to point out that the red color corresponds neither to blood nor to the dental cement used in early implant methods. At a demonstration in Tübingen pictures from a non-EU country were shown, and it was suggested that these had something to do with the research being carried out in Tübingen. 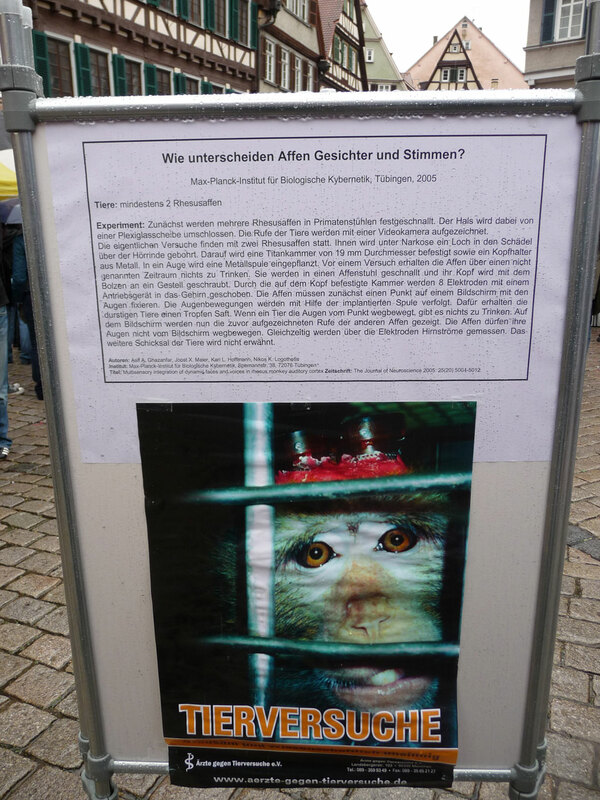 This distortion of facts was also noticed and criticized by people in Tübingen. 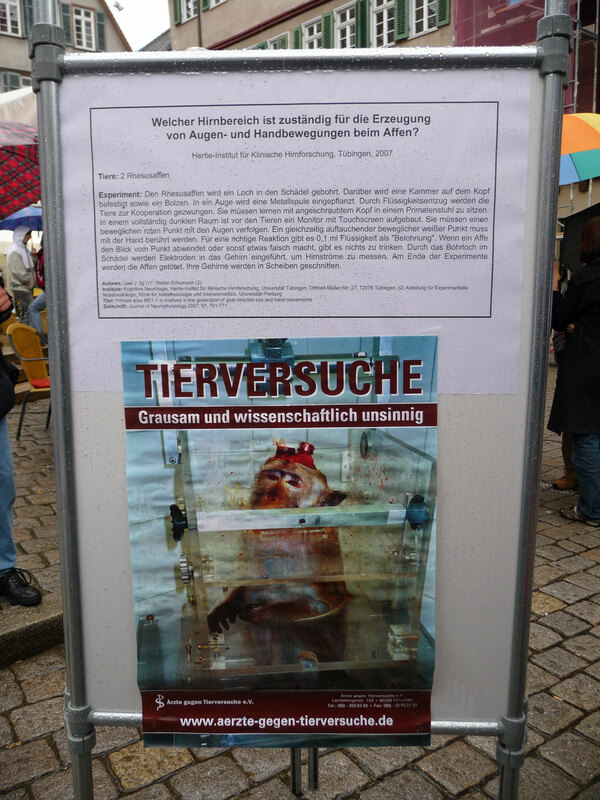 Picture of the demonstration in Tübingen on April 18, 2009. 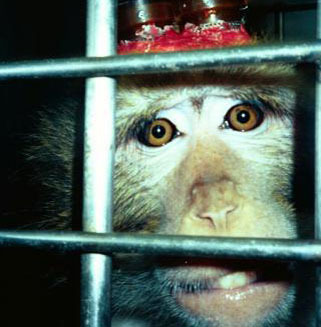 A rhesus monkey is sitting in a primate chair. A titanium implant has been implanted in the middle of its skull to immobilize its head during the experiments. This is necessary because otherwise it would not be possible for mechanical reasons to carry out measurements of eye movements and microelectrode recordings. Comparable examinations with humans require fixation of the head as well. At the back of the head on the left you see a recording chamber out of titanium. It provides access to the visual cortex of the brain. Recordings are made by opening the cover of the chamber under sterile conditions and carefully advancing microelectrodes into the brain. After the nerve impulses have been recorded, the electrodes are once more removed and the chamber is cleaned with a disinfectant rinse before it is securely closed. The animal does not feel the electrodes in its brain, because the brain has no pain receptors. The brain itself is never exposed, even during the implantation operation. The risk of infection would be much too high and would cause considerable mechanical instability during recording. The implants do not cause pain for the animals. 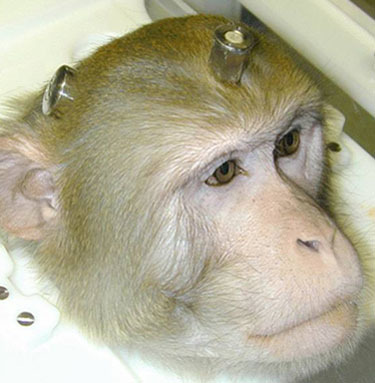 On the contrary: The monkeys behave completely normally and experience no discomfort or other negative effects from the implants. The white plastic collar below its chin is part of the primate chair in which the monkey sits and intently observes its surroundings. See more photographs on the page “The Social Life of Our Monkeys."